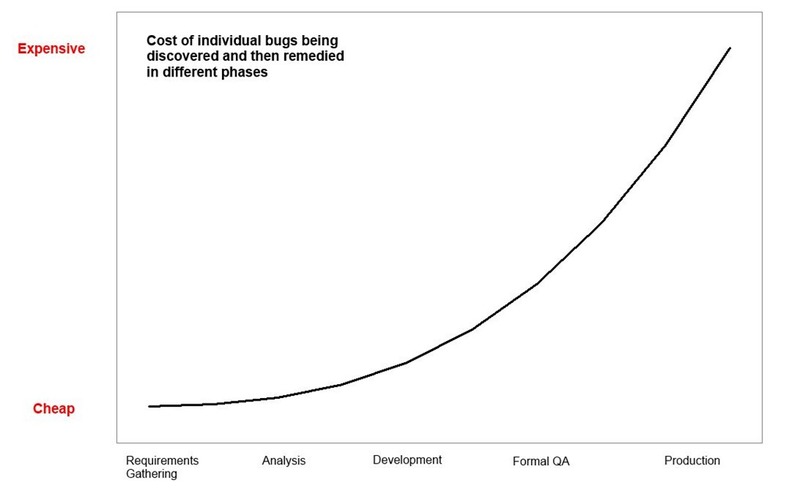 Last week I ran across a post by Paul Hammant’s blog, Testability and Cost of Change, that reminded me of another software engineering author, Barry Boehm, from my time. Paul included a quote which is the primary reason I believe the www.healthcare.gov web site will continue to have problems in 2014. Paul had a nice diagram of this relationship which I have reproduced here. While looking up information on Barry Boehm’s writings on software engineering I ran across a slide from Stevens Institute of Technology that listed some of the reasons software project fail. Not surprisingly many of these reasons are being used to describe the development and management of the www.healthcare.gov site. So how far are we away from a failed software project? Although I applaud Mr. Zients efforts to fix the front end bugs affecting the web site by November 30th , I think those of us who like to see the system fixed so we can move on to the unfinished business of health care reform are likely to be disappointed. Considering the multitude of security and back end problems along with admission that 40% of the system is not developed yet, it is easy to envision the public’s support for exchanges and the Affordable Care Act will wane further in 2014. The front end problems were not the most critical part of the system that needed fixing. They were the easiest to fix. At some point in 2014 we will look around and realize that when the average person believes the project has failed and they are not going to change their mind. Then the project has officially failed and the only question is when does the media recognizes the project has failed. So where does health care reform go if we have a failed web site? This is not the end of the world but it does make the remaining Affordable Care Act ideas that have not already failed much harder to implement. If you agree with me that the Affordable Care Act was primarily a political rather than a health care reform achievement then it is not unreasonable to argue that the web site has delayed health care reform for several years and that less partisan, incremental changes would have been more successful. Maybe this angst that we still have not done anything to rein in health care costs after four more years will bring clearer heads to the table. It is the elephant in the room. This partisan ring to rule them all has to go back to the mountain which bore it if we want “real” health care reform. A non partisan approach modeled after the procedures used to do identify which military bases to close is probably the best course of action. Although the Affordable Care Act supporters hate to admit this, the old system even with its problems continues to look much better than the new system with all of its problems. The biggest problem between the old system and the new system is that most of the designated “losers” in the new version have been arbitrarily chosen. This is never good politics and for some reason they continue to insist on saying that the Republican party is the stupid party. I wish! The new and improved version of the Affordable Care Act needs to have a whole lot less of these arbitrary “losers”. If you are designated as a Affordable Care Act “loser” then it should be something both parties can agree upon. Hopefully we can finally fulfill one of the President’s talking points and actually show people with “substandard” plans that there is a better and lower cost health care plan on the exchange. Picking arbitrary people as “losers” to fulfill your political ambitions for wealth distribution does not cut it!